Memorial Day in our town is pretty quiet, with the big parade happening the day before on Sunday, so we usually spend it just relaxing at home together and enjoying a quiet day, and if the weather holds, getting the backyard set up for the season. Most of the day threatened rain, but by 3pm it was sunny enough that we felt confident enough to get the chairs from the basement, clean off the grill and enjoy some outdoor time. This recipe evolved last summer, when I was looking for something different do to with shrimp on the grill. 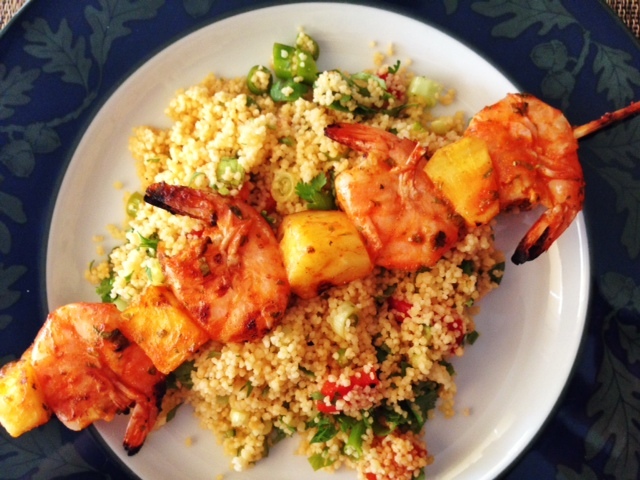 I wanted some heat–because, well, we like things spicy around here–so I found some recipes online that used sriracha in marinades for shrimp, but those usually also included honey and a bunch of other ingredients. 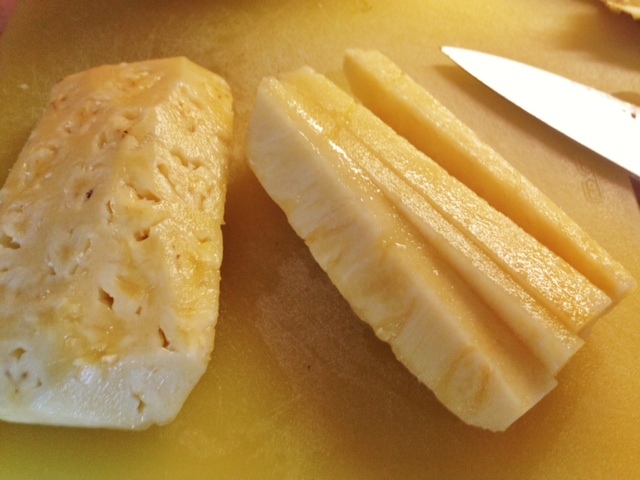 I wanted this to be as straightforward as possible, so I pared the glaze down to just the basics, and added the sweetness back in the form of pineapple on the skewers, which turned out to be a brilliant combination. This is such a simple combo of ingredients, it’s really not a recipe. The amounts can be varied to suit your taste (more or less spicy), but two points are key to the incredible taste of the finished product: be sure to use shell-on shrimp (I buy the easy-peel, which makes them a snap to peel after grilling), because the shells add more flavor, but also protect the shrimp while they are grilling; and you MUST use fresh pineapple. I served this over a no-cook couscous salad (similar to the one I used in this recipe), which is great for outdoor eating, but it would be equally good with some crusty bread or over rice. An off-dry Riesling goes really well with this. Double or triple (or more!) the recipe for larger crowds. Soak 4 wooden skewers in water for about 1/2 hour (or use metal skewers and skip this step). Combine first four ingredients in a jar with tight fitting lid. Cover and shake well to combine thoroughly. 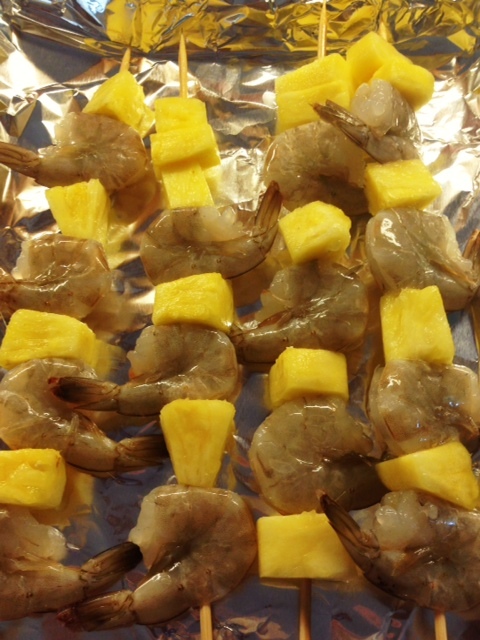 Remove skewers from water and, dividing as equally as possible, alternately thread the shrimp & pineapple onto them (each skewer will have 3 or 4 shrimp). If you have extra pineapple, and room on the skewers, feel free to load ’em up to the tip (more pineapple=more sweet & spicy goodness). 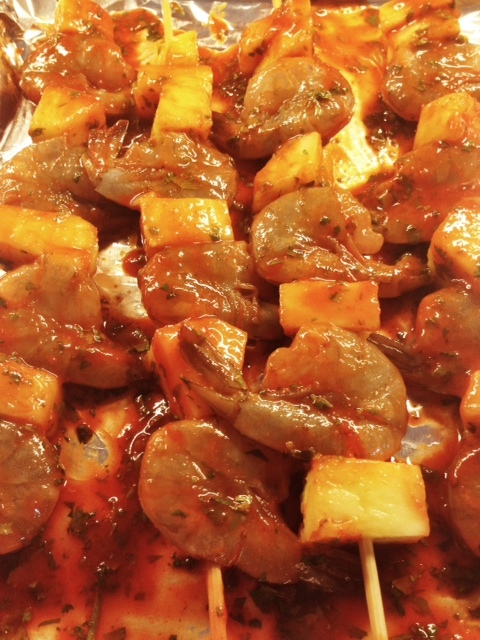 Set skewers on a sheet pan or 9×13 pyrex dish. Pour the glaze over the four skewers. Use a small pastry brush to make sure shrimp are coated on both sides with the glaze. Refrigerate for 20-30 minutes to let the glaze/marinade soak in. When grill is hot, lightly oil grates and lay the skewers down. Cook about 2 minutes, or until you start to see some light char marks on the first side. 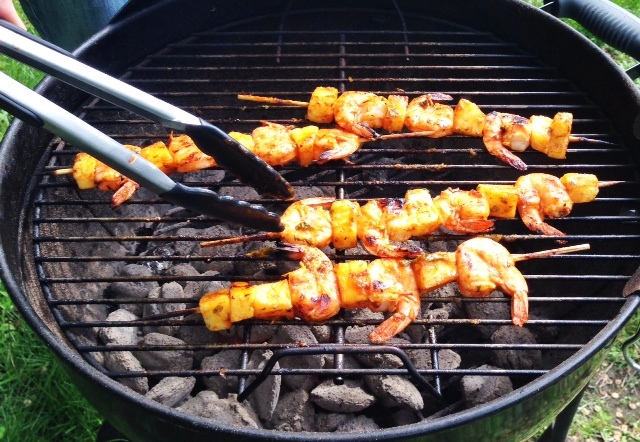 Flip skewer and cook another 2 minutes or until shrimp are just cooked through and pink. Remove and serve with couscous salad, rice, or crusty bread.